Donated by Kati Brown Designs - from our range of original jewellery designs handmade in Helensville, Auckland - just for you. 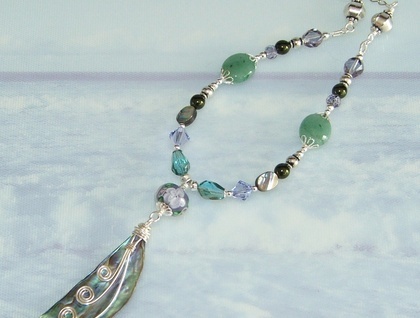 A lovely piece of natural paua shell, tumbled and polished to a smooth glossy finish, is wrapped in silver art wire and teamed with a beautiful lampwork glass bead reflecting the soft lavender and shimmering greens of the paua. 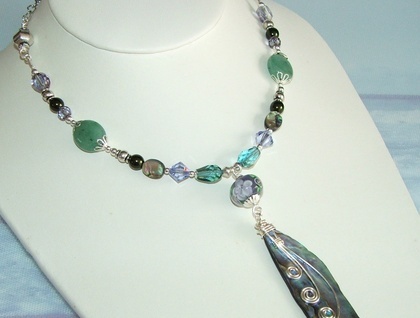 The necklace is made on flexible jewellers wire at the front, in a pattern that includes natural green aventurine gemstone ovals, sparkling faceted Czech crystals, deep green freshwater pearls, small paua ovals - all with lots of antiqued silver accents. 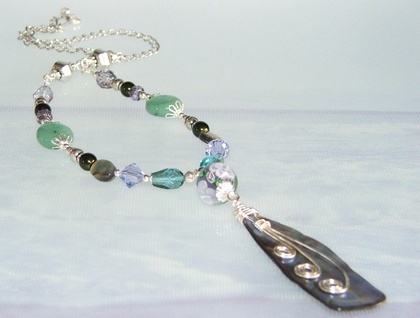 The front pattern is followed by individually made links with a pewter cathedral bead, then the necklace is finished with silver-plated curb chain so it sits nicely around your neck. The necklace is right on trend - and it is ummistakeably New Zealand. Like all my jewellery, ""Ocean's Gift"" comes in an organza gift bag as a treat for you to open or ready to give as a gift to someone special. Thanks for looking at my jewellery. I have more original items in my store here on FELT - please copy and paste this addy into your browser: www.kbdesigns.felt.co.nz "